If you want to avoid the Open Mode Warning on each boot, remove the disclaimer from the cal area (this can only be done while in closed mode, as the cal area becomes read-only when flashing open mode until closed mode is re-flashed. This is also the reason why you can't set a device lock code in open mode - the lock code is saved in the cal area) - this is an optional step, and just a cosmetic fix. Flash the Nitdroid Open Mode Kernel (be sure to read the "Known limitations" on that post) - this works both on the N950 and N9. wonderful :) Do you have any future plans on continuing on this? Some GUI app maybe? Anderson: Not really at the moment, no. 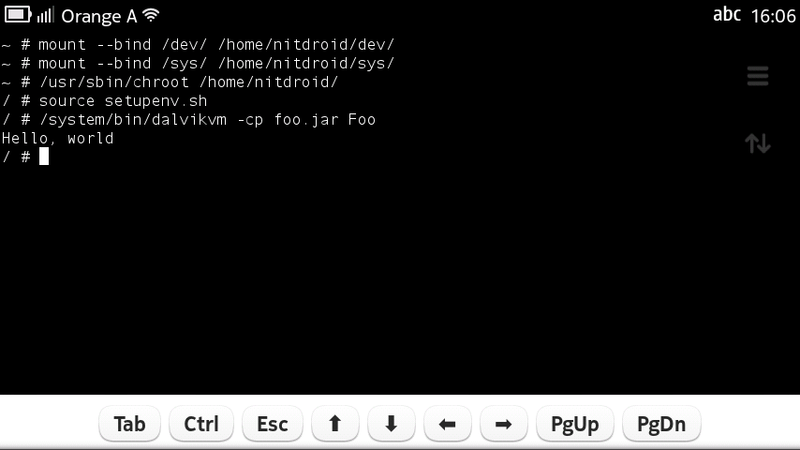 But if somebody wants to pick up from there, a virtual framebuffer driver (that gets the output from Android and then the framebuffer gets read by e.g. 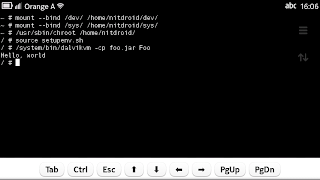 a Qt application "outside" the chroot) and some I/O juggling (touch events from the Qt app into a fake input event device going to Android) could do the trick.